Using ultrasound technology coupled with a custom-built guidance tool, team Ethos Medical has invented a guidance system to help physicians guide needles into the spine accurately and safely. The team is comprised of two recent Georgia Tech biomedical engineering graduates, Dev Mandavia and Cassidy Wang, and mechanical engineering alumnus Lucas Muller. Mandavia is a previous InVenture Prize winner, taking the title in 2017. “Our mission is to get lumbar punctures placed successfully on the first try, every time,” he said. The team has been working full-time to launch the company since inventing the device on campus last year. They have also been working closely with doctors in the Atlanta area to develop a prototype that medical professionals will use. “The next step for us is to begin the FDA testing process,” says Wang. On top of the cash prize, Ethos Medical will receive a free U.S. patent filing by Georgia Tech's Office of Technology Licensing valued at approximately $20,000. TremorTrainer placed second with their therapeutic weighted glove designed for patients suffering from tremors. They hope their invention will help those patients regain some of their fine motor skills — especially for everyday tasks that require the use of their hands, such as eating or writing. 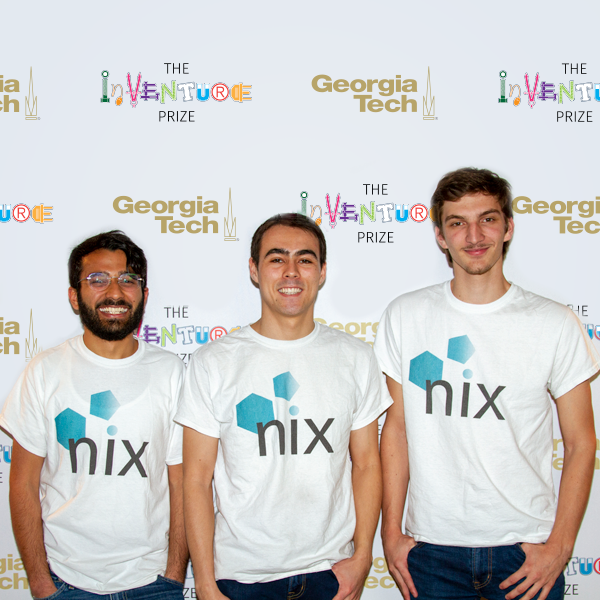 The People’s Choice Award — voted on by the general public — was given to Nix for their e-cigarette device, custom-coded to taper, reduce, and ultimately eliminate nicotine intake. The team will receive $5,000, and they plan to use it continue developing their smoking cessation tool. Nix includes current mechanical engineering students Mohammed Aamir, Robert Patterson, Dustin Sloan, Milan Smart, and Cory Stine. This is the 11th year of the Georgia Tech InVenture Prize. Team Ethos Medical will face off against inventors from all 15 Atlantic Coast Conference universities when they represent Georgia Tech at the 2019 ACC InVenture Prize, which will take place in Raleigh, North Carolina, on April 16 and 17.